$2,299 for a 9 day tour to Hanoi, Ha Long, Hue, Hoi An, Ho Chi Minh City (Saigon), My Tho and Cu Chi, Highlight for those with limited time. $3,339 for a 14 day tour to Hanoi, Lao Cai, Bac Ha, Sapa, Ninh Binh, Halong, Hue, Danang, Hoi An, My Son, Ho Chi Minh City (Saigon). This is the ideal way to explore Vietnam. 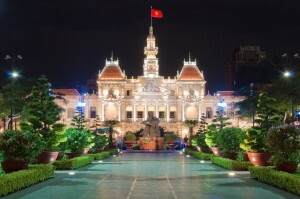 $5,499 for a 21 day tour to Hanoi, Hai Phong, Cat Ba, Halong, Dien Bien, Sapa, Bac Ha, Ninh Binh, Hue, Danang, Hoi An, My Son, Ho Chi Minh City (Saigon), Ben Tre, Can Tho (Mekong Delta), Cu Chi. This is the comprehensive way to explore Vietnam. $6,989 for a 21 day comprehensive tour of Vietnam, Cambodia and Laos to Ho Chi Minh City (Saigon), Ben Tre, Can Tho, Hue, Danang, Hoi An, Halong Bay, Ninh Binh, Hanoi, Luang Prabang, Pak Ou Caves, Vientiane, Phnom Penh & Siem Reap.